By the way, what are Attack Peas? Where do I find Attack Peas? As of this writing, only three Attack Peas have been released, and those are the Attack Pea, Seasonal Attack Pea, and the Super Attack Pea. You can only find those peas at the Smuggler’s Cove in Krawk Island. Unfortunately those three Attack Peas are already out of stock, and as a result it will cost you a few hundred million Neopoints to buy one from another Neopian (due to its limited quantity and good Battledome stats). Don’t lose hope, though! There’s still a place where you can get an unlimited supply of Attack Peas. It is in a place filled with lush vegetation such as gigantic turnips and cabbages, twenty-foot string beans, and a rich variety of never-before seen fruits and berries that even Jake the Explorer hasn’t seen yet. This place still has no name, so I've decided to call it Veggie Island. Sssshhh!!! Don’t tell TNT that I told you about it. By the way, I won’t tell you how I got there because it’s a secret for you to find out... and one more thing -- it's where those pesky pirates took those mega cabbages and artichoke bombs, so stock up before you leave. As I mentioned earlier, there are only three unique Attack Peas that have been released to the public, and those are the Attack Pea, Seasonal Attack Pea, and the Super Attack Pea. Actually there are still a lot of unique Attack Peas that are not yet released and this guide will be giving you an overview of what those nasty peas can do in battle. NOTE: Arranged in random order! Eeeww! With a smell worse than that of a Rotten Negg, who would be able to take it? For sure, anyone who will be able to smell it would get suffocated so I advise you to wear a Gas Mask Filtrator 3000 before using it. The Rotten Attack Pea does 20 earth, 10 dark and 3 physical icons, which totals 33 constant icons. It is also advisable to throw the Rotten Attack Pea directly to the FACE of your opponents so that there’s no chance for them to escape the wrath of the Rotten Attack Pea. Before I forget, don’t hold it with your bare hands. Eeeww! With all those Neopians boasting about their Attack Peas and showing them off at the Trading Post or displaying them at their Gallery, surely you’ve felt envious at some point, right? Not anymore, however, because the Fake Attack Pea has come to satisfy your need! The Fake Attack Pea may only do 3-5 physical icons, but it's still a great addition to any gallery looking for Attack Peas (just cover the word FAKE in its name... joke!). Oh, and another thing: never use it for scamming others or you will get frozen. Planted and harvested during the hot climate of the months of Running and Eating, the Flaming Attack Pea is indeed one of the most unusual Attack Peas due to its changing number of icons when used in battle. If used on the 4th turn or later, the pea will turn into a pile of ash and will do no damage to opponent. Therefore, it is advisable to use the Flaming Attack Pea on your first 3 turns and use other weapons instead from that point on. Looking for the best freezer in Battledome? Well, say goodbye to the Sleep Ray and stop dreaming of a Moehog Skull from those Rotting Riches Scratchcards because the ultimate freezer is now here, The Frozen Attack Pea. The Frozen Attack Pea is a once per-battle 100% freezer that deals 15 water and 15 air icons, along with blocking 10 fire icons. Just don’t let it be stolen by your opponent, or else victory will also be stolen from you. With its bright pink color and iridescent glowing wings, who would expect it to do great in battle? Well, think again, because this nasty little faerie thingy might just do to you what you never expected. Faerie Attack Peas are blessed with magical powers from different forces of nature by the Queen of Faeries, Fyora. The Faerie Attack Pea does 10 of each icon (light, dark, water, fire, earth, air, and physical), which means a total of 70 constant icons. It also reflects 30% of attack icons received and heals 50% of your max HP when your HP is below 10 percent. These peas can also be found at Fyora’s Palace Garden, where the magical Faeriecinths grow. If you manage to get there, try to pick one up when Fyora’s not looking at you. However, if you get caught… well, it’s not my problem anymore. The greatest result of biotechnology in Neopia, Genetically Modified Attack Pea is the ultimate weapon you will be craving for, due to its good attack and defense properties and its special effects in the Battledome. 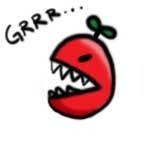 The Genetically Modified Attack Pea does 20 of each icon (light, dark, water, fire, earth, air, and physical), which means a whopping total of 140 icons. It also reflects 70% of attack icons received and blocks the other 30%. When HP is in red, it heals the user to full hit points and it can also freeze the opponent if it successfully reflects 10 water and 10 air icons used by opponent.